The Nomad Hostel in Seville is truly a 5 Star Hostel, recommended for solo-travelers, couples and families alike. 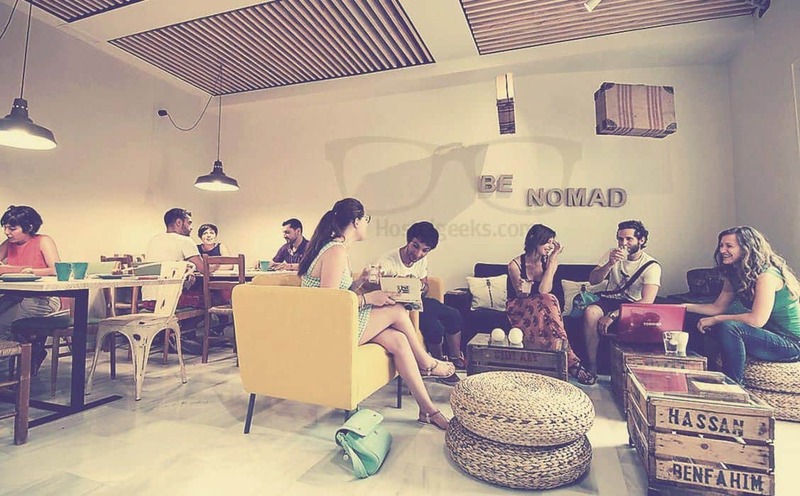 Opened in August 2014, the Nomad Hostel captured the hearts of travelers and backpackers right away. The accommodation offers a warm social environment to slow down, have a rest, and connect with other travelers. If you’d like, you can get some drinks at the hostel bar, and join the hostel events or the free tour around the Andalusian capital. How to book The Nomad Hostel? You just found our #1 recommendation for best hostels in Sevilla. Genuinely, The Nomad Hostel is the accommodation we recommend to our friends, family, and to you! You will like it! Planning to stay at The Nomad Hostel? Please use the links provided above. The Nomad hostel is located right in the old town of Sevilla, just 5 minutes from the river, and 5 minutes from the cathedral. 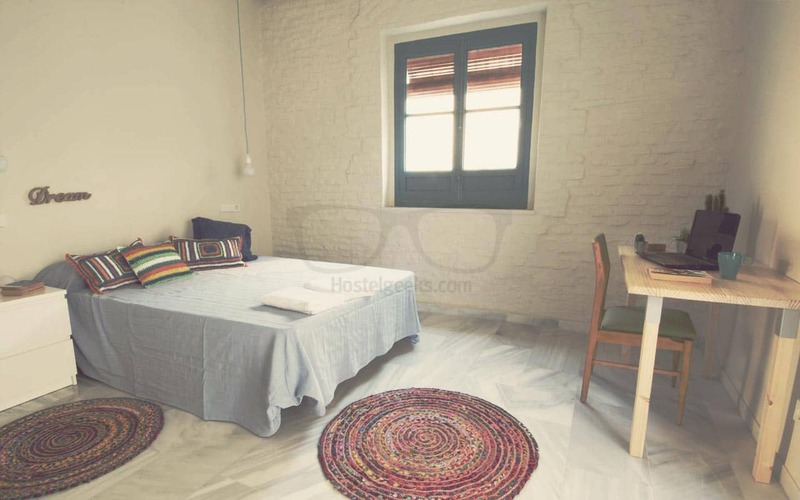 The location is very convenient if your are looking for a place close to the alternative more local neighborhood, the river, and the old town. Next to the hostel you have a delicious restaurant where you can get a discount through the hostel. The street the Nomad Hostel is located on is a small side street, so you won’t have any big party crowds next to the hostel, nor are there any bars directly at the hostel. It’s got the best of both worlds – it’s right in the heart of the old city center, but it’s tucked away from the noise and crowds. You’ve got everything you want to see within minutes outside your door, but when you’re ready to rest up for your next day of adventures, you’ll be able to get a good night’s sleep. Arriving by plane, get out of the airport and take bus EA. Get off at the last stop, plaza de Armas (~35 minutes). Once there you will see a big square in front of you, and on the left side of it a huge hotel called NH. Take the street on the left of the hotel, calle Alfonso XII, and start walking straight. Keep on going until the end of the street, where you will find another square, called plaza del Duque. When you reach a Burger King turn right onto a wide commercial street and then take the second street on your right again (it’s calle O’Donnell, you will recognize it for a clothes shop called Pull and Bear on the corner). Go straight and almost at the end of the street you will find us on your left, in calle Itálica 1. And speaking of being social, The Nomad Hostel also organizes different events at their rooftop terrace. 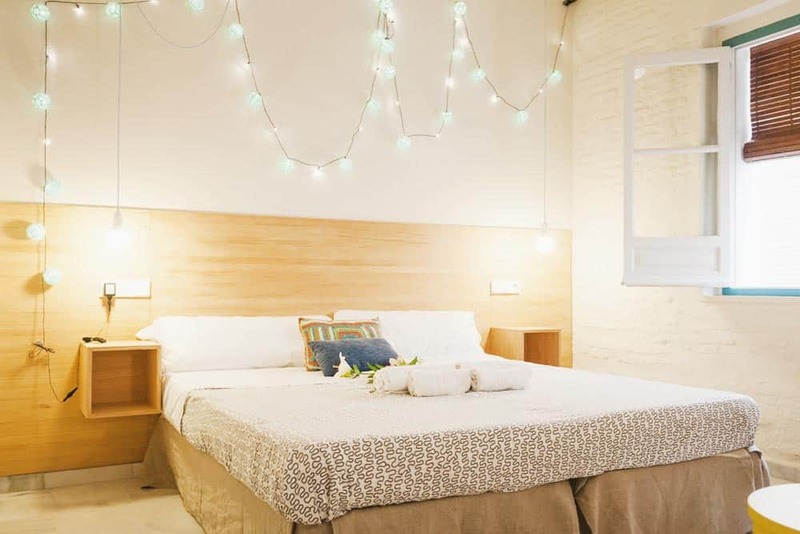 This charming and homely 5 Star Hostel in Seville is a great choice to actively support the slow travel movement, and their staff pay close attention to creating an Eco-friendly environment. Read our guide to the best hostels in Seville, Spain. We are Hostelgeeks, your independent shortcut to the worlds finest hostels, the 5 Star Hostels. We are hunting down the best hostels in the world for you, and put them under one roof. 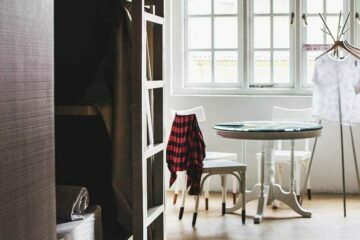 So you can find your accommodation with 1 click and spend your time exploring the world instead of researching hostels. Here’s our guide to the best hostels in Spain, including itinerary and hidden gems. psssst: In the English language, the city is called “Seville” with an ‘e’. We still stick with Sevilla. 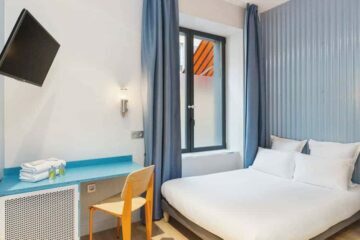 Let’s check out why this Sevilla Hostel is awarded with 5 Stars. The Nomad Hostel has its own green guidelines to ensure that travelers are staying in safe, non-toxic and energy-efficient accommodation. This guide includes non-toxic cleaning agents, laundry detergent, and 100% organic sheets and towels. On top of that, all bunk beds are hand-made (and fair trade! ), and the lighting throughout the building is completely energy-efficient. For coffee lovers, the Nomad team only serves organic, free-trade coffee at the bar. Big plus: there are also non-disposable dishes and utensils. The trash in the kitchen is separated, so you can easily contribute to the eco-friendly practices yourself. You can see their philosophy written on the kitchen wall above the sink – “a nomad leaves no trace” – as a reminder to each traveller to do their bit. As you can see, Nomad Hostel Sevilla is a fully green hostel! 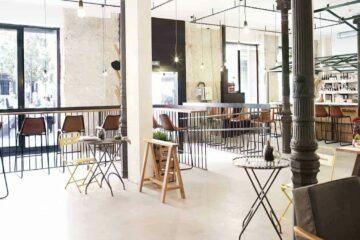 Last but not least, the Nomad Hostel is managed by local Sevillanos – another big sustainable factor. There are also some local stars at the breakfast bar; they have local Sevilla orange marmalade, fresh local tomatoes, and organic olive oil. Yum! The wooden design all over the building goes perfectly with the cozy sofas and beds decorated with dozens of pillows. No TV, plenty of travel books, and travel accessories like small suitcases all help you feel the passion for travel permeating this hostel. Nobody would ever want to watch TV here. Instead, the decorations keep you in your travelling mood, rather than becoming an unsociable TV zombie. The living room is ideal for hanging out and meeting fellow travelers. There are two large tables with lots of chairs and a cool hangout section with couches and squashy chairs set against a backdrop of travel photographs and an abstract world map. Or if you’d rather go out onto the deck, pull up one of the wooden chairs and enjoy the Sevillan sunshine. Have you ever heard about the Andalusian lifestyle? 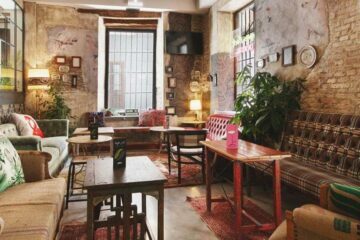 The Nomad Hostel is a wonderful reflection of the Sevillan way of life: slow, cozy, and heartwarming! With the three common areas, including the interior terrace, the chill-out lounge, and the rooftop terrace, this 5 Star Hostel is the perfect place to meet people of all ages. Whether you’re cooking up a local specialty in the kitchen with your hostel mates, relaxing in the common area, or taking in the sun on the terraces, there are plenty of places to enjoy the hostel and your fellow hostel-goers. Don’t forget to head up to the massive rooftop terrace, where there’s always something going on. Its walls are decorated with buckets of flowers. See if you can spot similar decorations out in Sevilla’s historic neighborhoods! When it’s time to go to bed, you won’t be finding your typical lumpy hostel bed. No, these hand-made, fair-trade bunk beds are super comfy, from the mattresses to the bedding. Each bed also has its own small shelf with an individual reading light and outlet, so you won’t have to race to be able to charge your phone. The common areas are inviting and a great place to meet fellow travelers. Whether you have a cocktail on the rooftop or hang out in the lounge next to the interior terrace – you’ll have lots of opportunities to meet and connect with new people, whether it’s your fellow hostel-goers or the local staff. Actually, there are so many great places to kick back in relax in the hostel that you may be tempted to spend more time here rather than going out and seeing the city. The owners and their team are always around the hostel, joining in on events, giving you the best tips for Seville. When you have a drink with them at one of the events, just ask them for the best tapas restaurant in Seville or whatever you need and want to know about Seville. They’ll know the best answer for sure. They have handy maps on hand and are more than happy to point out the best of the city’s sights, eats, and drinks. And they’re not just telling you a typical list of tourist traps; they’ll genuinely share their own personal favorites with you. The staff love their city and hope that you will, too. Spain is fun, and you can have an unforgettable time – when staying at the good hostels. We traveled all over Spain to hunt down the absolute coolest backpacker hostels in Spain. We only recommend hostels we visited and we would send our best friends to! Fancy a promo code for The Nomad Hostel? Who doesn't?! Now, there is no easy way to say this: Currently we do not have a valid discount for The Nomad Hostel. We are working on getting more promotional codes for The Nomad Hostel in Sevilla and all the other top hostels we reviewed for you. You were looking for the absolute BEST hostels in Sevilla? You just found it! 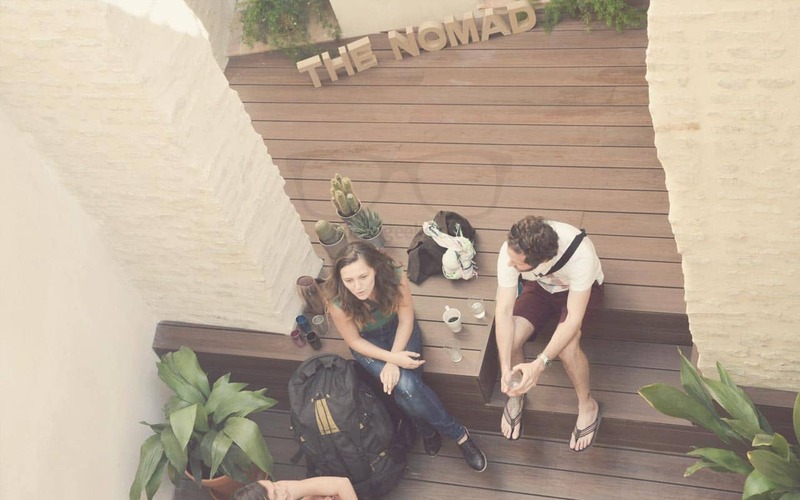 The Nomad Hostel is the top place we recommend to our friends, family and to you! Update April, 2019: How to find flight deals to Sevilla? Still looking for cheap flights to Sevilla? We LOVE Kiwi.com. You can search here with a so-called "radius search". It is incredible easy to find sweet flight deals to Sevilla and area.